Seven Production is a specialist provider of high tech Video and TV production services, based in the UAE and serving the entire Middle East region and beyond. Since we established the company in Dubai in 2009, we’re delighted to say we’ve carved out an esteemed reputation for delivering a compelling combination of cost-effective production services and world-class talent. 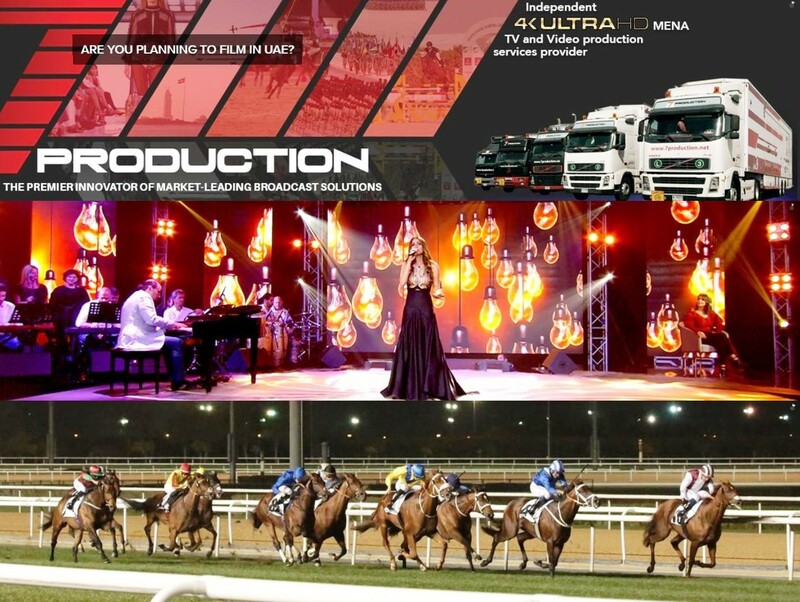 Proudly, we lay claim to the production of top TV shows including Victorious, MasterChef Arabia and Arab Idol, and we are the team behind major live events including the Dubai Rugby Sevens, RedBull Car Park Drift, Dubai Music Week, Dubai Tennis Championships, and the Chanel Fashion Show. Quite simply, we go above and beyond expectations to deliver customized solutions and outstanding results time and time again. All of our clients (and they range from government bodies to production houses and event specialists) can rely on us to provide them with turnkey live or recorded video & TV production solutions & unrivalled operational support. Seven Production is operating 8 OB Trucks across the Middle East. Broadcast Solutions has begun delivery of a major order to Belarus’ state broadcaster Belarus TV. Belarus TV, BelTV for short, has commissioned four production sets to Broadcast Solutions, one of Europe’s largest system integrator. Each set comprises an 18-camera HD OB Van, a 4-camera HD flightcase studio and a support vehicle. The first two production vehicles left Broadcast Solutions’ production facilities in December 2018 and the bulk order will be completed by April 2019. Until this date, the other identical sets will be delivered to the customer at regular intervals. Successful premiere for the largest color grading theater in western Germany: In December, the producers of the spy thriller “The Operative” were the first film team to deploy the new digital color grading facility called “The Suite” in Cologne. The ten meters (33 ft.) wide screen and the state-of-the-art cinema projection and sound technology enable film makers to implement particularly precise color corrections. The offer is very well received: several film production companies already have booked into the color grading theater for the first half of 2019. MMC Studios developed “The Suite” together with the renowned post-production company “WeFadeToGrey”. It’s the fourth consecutive year that Andy has lit the famous UK seaside resort’s panto, which was directed by Damian Sandys with whom he also worked on the 2017-18 production. This was a huge advantage to the fluidity and creative flow of this year’s show, together with knowing the venue, a beautiful original Matcham house that is notoriously tight for space when installing the complex modern productions of the 21st century. Andy chose Robe as his main lighting fixtures for several reasons. “I’ve spec’d and worked with Robe on numerous shows and I know the products really well” he explained, adding, “there is a great choice of fixtures, their LED light sources are of an excellent quality and overall the kit is super reliable”. Amidst the thousands of celebrations happening world-wide for the 2018-2019 roll over… the New Orleans Jazz Orchestra (NOJO) played a very special Great Gatsby themed party in the super-plush lobby of the Ritz-Carlton Hotel in Dallas, which required diligent lighting to produce the correct ambience. Randy Cline of Time Matters Entertainment, based in Plano just north of Dallas, was the event’s technical producer, coordinating all the staging elements, and working for communications agency Wheelhouse Marketing & PR. He asked lighting designer Eric Wade of Crossfade Design to create a dramatically different lighting scheme to set the scene and a stylish tone for a classy evening of fun and music. "Both Grass Valley and ChyronHego have a decades-long tradition of broadcast technology innovation. It was just a matter of time before we got together to create synergy between the world's most widely deployed broadcast graphics system and the global leader in sports production switchers," said Randy Dickerson, ChyronHego's national director, sports venues and strategic accounts. "Formalizing a new, specific integration solution is great news for our joint customers. It means we can create synergy at the engineering and creative level to give TDs more control and greater efficiencies in fast-paced, high-pressure live arena production environments." Southern Cross Group Stadium is the proud home of the 2016 NRL Premiership champions the Cronulla Sharks. Based in the Sutherland Shire, Southern Sydney, New South Wales, the Sharks compete in the National Rugby League, Australasia’s premier rugby league competition. Being champions means their stadium is often filled with spectators rooting for, and athletes competing against, the other 15 teams in the NRL. But in November 2015, the stadium found itself competing with its NRL rivals in a different arena: fan engagement. That’s when global consulting firm EY put out its Sweeney Report issue comparing the home game experience of venues across the league. And the stadium where the Sharks play, in the Sutherland Shire suburb of Sydney, Australia, came out on top. The Canadian Football League’s 2018 season concluded on Sunday, November 25 when the Calgary Stampeders defeated the Ottawa Redblacks 27-16 in the 106th Grey Cup, held in Commonwealth Stadium in Edmonton, Alberta. While fans in the stands of the largest open-air stadium in Canada (seating capacity of 55,819) saw a great game, they also heard from some fantastic entertainment. Brother-sister country duo The Reklaws got the audience fired up during the pre-kick-off show, and then Canadian songbird and Grammy Award-winner Alessia Cara rocked the half-time show. FM Systems ensured that all sounded fantastic thanks to a uniquely deployed L-Acoustics K1 sound system, loaded on custom-fabricated carts that were brought onto the field for the performances, and then wheeled out during game play. Superstar Dutch DJ Martin Garrix launched his new “ANIMA” live performance concept with two hi-energy, hi-profile nights at Amsterdam’s RAI with the five-day 2018 Amsterdam Dance Event (ADE) festival and conference as the backdrop, an event drawing dance music, media and technology professionals and enthusiasts from worldwide to this vibrant city right at the hub of dance music culture. Superstar Dutch DJ Martin Garrix launched his new “ANIMA” live performance concept with two hi-energy, hi-profile nights at Amsterdam’s RAI with the five-day 2018 Amsterdam Dance Event (ADE) festival and conference as the backdrop, an event drawing dance music, media and technology professionals and enthusiasts from worldwide to this vibrant city right at the hub of dance music culture. The ‘Lighting the Stars’ series of conferences featuring internationally renowned lighting designer Patrick Woodroffe landed in Ho Chi Minh City in November with the aim of celebrating lighting and discussing its future. The event, which was organised by Vietnam ProAVL Co. Ltd alongside Claypaky and MA Lighting, presented Woodroffe to an audience keen to hear first-hand about his thirty-year career at the forefront of live music, event, architectural and theatre lighting design. Indeed, Woodroffe has designed the lighting for a diverse array of big-name projects, from the London Symphony Orchestra to ABBA, from the Rolling Stones feature film Shine A Light to the Vanity Fair Oscars party to Prince Charles’s Highgrove House gardens. His achievements are remarkable. Country music sensation Dylan Scott recently organized a charity concert for kids in his home town of Sterlington, Louisiana, and used an all Elation lighting rig along with ADJ video panels to light the event. Extreme Lighting & Sound (ELS) of Nashville, Tennessee, supplied the lighting and video gear for the inaugural event. Bayou Stock, held November 17th at the Sterlington Sports Complex, featured performances by Mark Chestnut, Morgan Evans, Lainey Wilson and others, not to mention Dylan Scott himself, and raised $30,000 to buy presents for underprivileged kids this Christmas. Stage Tec, the Berlin-based manufacturer of professional audio technology, sponsored a fully IP-based live production at the 35th Congress of the Chaos Computer Club (35C3). Five ON AIR flex mixing consoles and six NEXUS Base Devices were provided for the international hacker scene meeting from the 27th to the 30th of December 2018. The Congress took place at the Leipzig Exhibition Centre. Lectures and workshops on technical and social topics were held in five event halls. The live streams from these halls were mixed by the five IP-based ON AIR flex consoles in a control room. Connections to the NEXUS Base Devices, which were located FOH in the halls, was via a DANTE network in AES67 mode. The pro audio year kicks off with some high-caliber product launches at NAMM: Sennheiser is showcasing exciting entry-level wireless systems for both bands and videographers, along with two brand-new in-ears in its IE range and the SK 6212 mini-bodypack transmitter for live audio and broadcasting applications. Neumann.Berlin is presenting its very first pair of studio headphones and a new KH line subwoofer. More details on the products will be revealed at the show. Alongside these new products on display at NAMM, the Sennheiser and Neumann portfolios will make music enthusiasts’ hearts beat faster with everything from classic studio and stage microphones to rock-solid wireless microphone systems and in-ear monitoring systems. Also on display will be a range of studio headphones and monitoring loudspeakers.